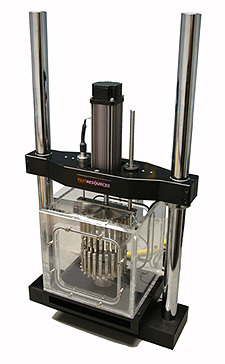 Mechanical endurance or fatigue tests are required on any device placed inside the human body. Most test standards include both Static and Fatigue protocols to simulate the loaded conditions - especially all orthopedic and vascular devices. Photo - VASCULAR FATIGUE TEST - Model 800LM High Frequency Test System with saline bath and multiple samples undergoing long term fatigue testing. Orthopedic devices also require fatigue tests - including spinal Implants and devices. Photo - Model 800LE (saline bath not shown) - performing spinal implant fatigue tests per ASTM test standards. 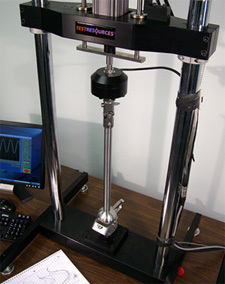 Tensile and compression tests are required on virtually all devices - whether for use in the body or not. Our products and their applications cover the gamut and include low force medical device testers; biomaterials biaxial testers; tissues and joints; tensile testers; compression testers; biomaterials and biomechanics research.